Timothy Wilde is a New York policeman, a wearer of a copper badge who may be of small stature but has a huge need to see justice done. He is quite the opposite of his brother Valentine, a big-shot in the corrupt Democratic machine that runs the city in the days of corrupt Tammany Hall, but despite their differences they are always there for each other. This adventure pits Tim against slave hunters who have kidnapped a free black woman and her young nephew and whose incredibly beautiful sister is married to a white man with a secret identity. He meets a vigilance committee, a group of free blacks who have banded together to help those other free blacks who are the targets of kidnappers who sell them into slavery and get away with it by pretending to be catching escaped slaves. The evil madam, Silkie Marsh, is still up to nefarious deeds. 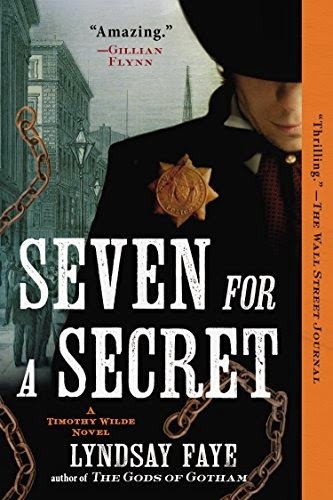 Well researched with the slang of the New York criminal class and vivid descriptions of the filth, poverty, and stink of mid 19th century Manhattan. I generally don't review paperback reprints but this trade edition came in and I had missed it when it came out last year in hardcover.